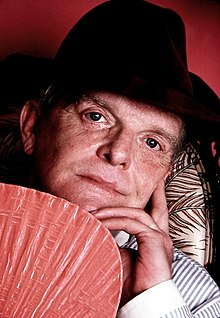 Truman Capote (born Truman Streckfus Persons, September 30, 1924 - August 25, 1984) was an American author. He was born in New Orleans, Louisiana and grew up in Monroeville, Alabama, New York City and Greenwich, Connecticut. He is best known for writing the half-true novel, In Cold Blood. The novel is based on a murder that happened in Kansas in the 1950s. He became good friends with the man accused of the murder. Capote was openly gay. He died of liver cancer in Los Angeles, California, aged 59. This page was last changed on 11 September 2015, at 14:34.